These wires are absolutely great for me. I have recommended them to all my friends who alter bras. They are sturdy and supportive, without being too hard and painful. I can once again wear bras comfortably: they don't ride down or dig into my stomach, which is fantastic. I wear size UK 40JJ in RTW bras and I have replaced all the wires in my favorite bras with these wires in size 56. 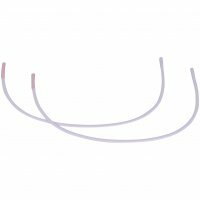 I have a very serious omega shape and the only problem I have with these wires is sizing down to get the right width I end up with wires that are quite short at the gore and sides, and they sometimes dig in to my side underarm fat and sternum, especially on bras with tighter bands. I would love to see keep this wire in this height for plunge bras and a slightly taller height for those of us who are omega shaped! P.S. I normally wear size 48 or 50 in regular vertical wires.